Now into the second half of 2016 and the dividend train is still chugging along. That is the great thing about owning top dividend paying stocks. You can step away for a couple weeks (or longer) at a time and come back and these stocks are working hard for you. At the end of each month, I take a bit of time updating our dividend income results. These updates or “snap shots” as I like to call them allow us to see the growth of our portfolio. We can track month to month or year to year to see how stocks in our portfolio have grown over time. We even have our results dating back as far as 2012 which really shows how the portfolio has changed in that time. 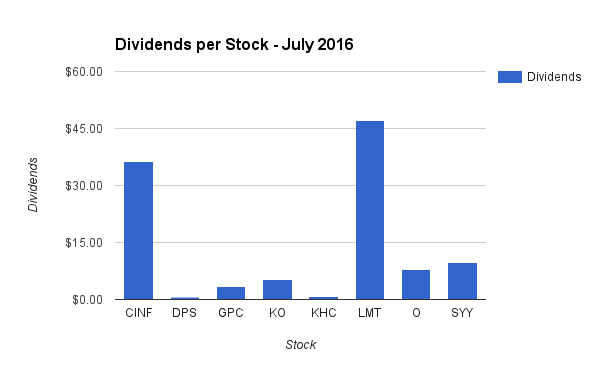 July dividend income continued an upward swing for 2016 compared to the same month the past several years. While not even close to being our highest dividend income month, this past July still saw growth. Just like January, April, and October – July is traditionally a lower dividend paying month of the year. This is because of the quarterly dividend payout cycle, which is lower for these months. Fewer companies pay their dividends in these months – which translates to lower dividend income. As long as we keep moving our combined dividend income higher and higher, we will be doing our job growing this income stream. We saw an increase of over 8% last month compared to July 2015! Months and months of investing new money has helped to increase our dividend income. 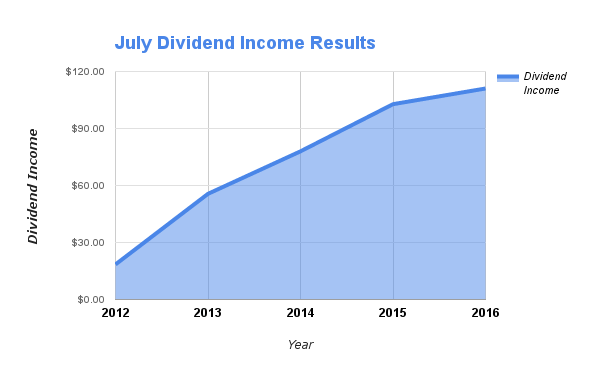 The dividend income earned in July ($111.05) was up over 8% from the same time last year. Despite a lower amount of dividends than last month (June 2016), we still saw growth compared to July of last year. Our goal for 2016 is to earn $2,250 in dividend income. To date, we have earned $1,021.65 in dividends for the year. At this point, we are on pace to earn a little over $1,750 in dividends for the year. It doesn’t look like we will hit our goal of $2,250 – so we are going to try and break the $2K mark at a minimum. 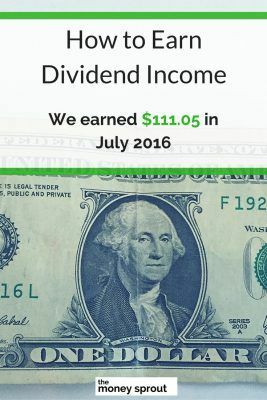 How was your dividend income in July? Full Disclosure – At the time of this writing, we owned shares in the following stocks noted in this post – AFL, CINF, DPS, GPC, KHC, KO, LMT, MSFT, O, SYY, TGT, and WMT. The material above is not a recommendation to buy. Please do your own research on a company before deciding to invest.